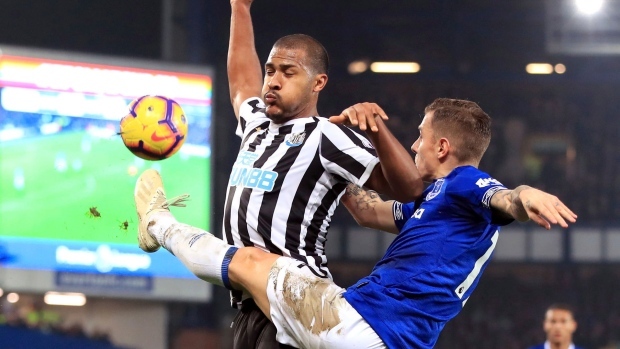 LIVERPOOL, England — Brazil forward Richarlison cancelled out Salomon Rondon's early strike to earn Everton a 1-1 draw at home to Newcastle in the Premier League on Wednesday. Newcastle grabbed the lead against the run of play in the 19th minute after Jacob Murphy beat Seamus Coleman on the left to curl in a low cross that Rondon met with a sliding finish at the back post. Visiting goalkeeper Martin Dubravka produced a series of superb saves but couldn't do anything about Everton's equalizer in the 38th, with Gylfi Sigurdsson's corner rebounding off two Newcastle defenders before falling at the feet of Richarlison to sweep home. Everton's pace dropped in the second half as Newcastle sat deep to protect a point and move further away from the bottom three. Having heard yet more media speculation of a potential takeover in recent days, United's fans at least had something tangible to take home.